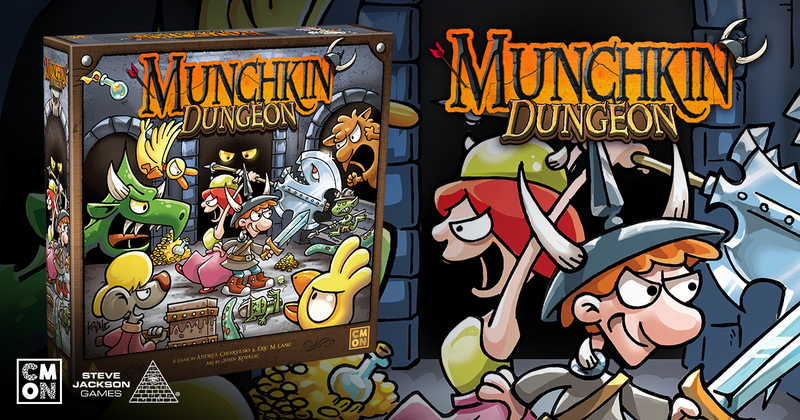 CMON Limited announced today that they have teamed with Steve Jackson Games to design and publish Munchkin Dungeon based on the award-winning card game. "Between Eric's experience on the Munchkin Collectible Card Game, John's years of work and knowledge of the Munchkin game, and CMON's talented sculptors, this is going to be an incredible new Munchkin board game and I'm looking forward to playing the completed game,” said Phil Reed, CEO of Steve Jackson Games. Steve Jackson Games, based in Austin, Texas, has been publishing games, game books, and magazines since 1980. Its best-selling game is Munchkin, with over 8 million copies of the games and supplements in print worldwide. Other top sellers are GURPS (the Generic Universal Role Playing System), Zombie Dice, and Illuminati. Past hits have included Car Wars and Toon. Steve's very first game, Ogre, originally released in 1977, has recently been released as a video game on the Steam platform, bringing a tabletop classic to a new generation of fans.